How to kickstart your PMP preparation! Exclusive Offer – only this Month, act now! : Get the most popular “PM PrepCast for CAPM Elite” – the PM PrepCast for CAPM PLUS the CAPM Exam Simulator at a discounted price! This bundle here is probably the best combination of prep material you can get to assure your exam success within that short time! Do not hesitate to secure your package now at this special price till November, 30th! Act now! Register Now and receive 10% Discount! Master the concepts from A Guide to the Project Management Body of Knowledge (PMBOK® Guide) work and know them like they are second nature. Prepare with 600+ Realistic CAPM Exam Sample Questions. Re-Imagined to Ensure You’re Ahead on Exam Day. Everything is Designed From the Ground Up for Fast Online Learning and Maximum Ease of Mastery and Retention. OSP International LLC has been reviewed and approved as a provider of project management training by the Project Management Institute (PMI)®. Track Your Progress Throughout the Lessons. Download All Lessons to Your Phone or Tablet. Certificate for 23 Contact Hours. For more details to each of that points and much more infromation about what to expect go HERE! 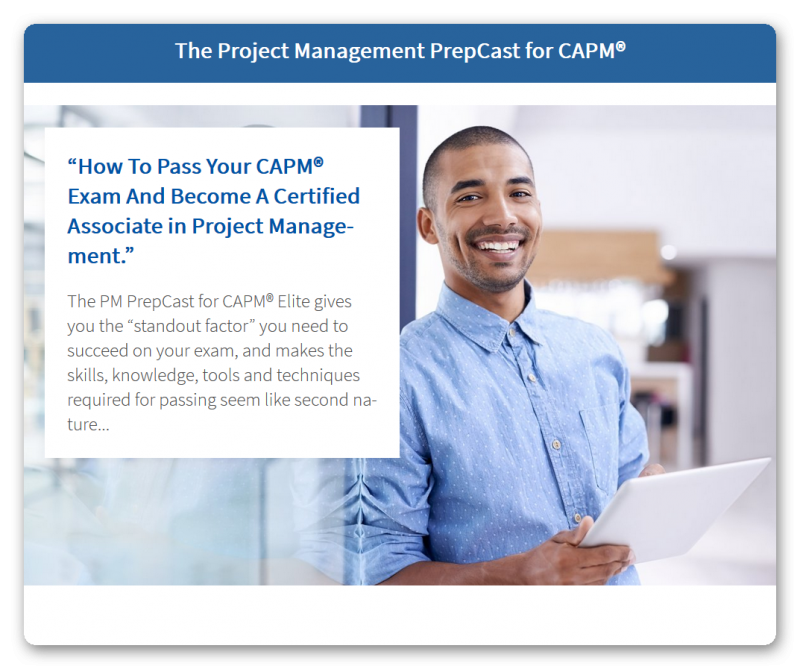 With the PrepCast for CAPM Elite you do not only get the course but in addition you will get the probably best CAPM Exam simulator out there! Best-selling product that has helped thousands of CAPM® aspirants pass the CAPM® exam – The CAPM Exam Simulator! ♦ Access countdown only starts when you take the first exam! ♦ Practice exams on your preferred device. Anytime. Anywhere. Prepare for and feel 100% confident to pass your Certified Associate in Project Management (CAPM)® Exam by using The CAPM® Exam Simulator. The simulator gives you access to 650 realistic CAPM exam sample questions in an online environment. Question difficulty and style is very close to any question that you will encounter on your actual exam. A team of certified project managers (one of them was even a former volunteer who developed questions for the Project Management Institute (PMI)®) not only developed all questions to be as close to the real things as possible, but they are also updated them to the latest CAPM Exam Content Outline as well as the most recent PMBOK® Guide. ​No clue ​HOW and ​WHERE to start? That free Ebook will ​show you! ​Click here to ​get ​your Ebook immediately and kick start your PMP preparation! For instance you will learn which study materials you "must have" and which are optional. You will get advice ​from Experts on how to start and how to set up your learning environment in a way to gain success! Yes, i want that FREE Ebook! ​MP4PM Project Charter Package - FREE Download! ​​If you are interested in a pre-taste of MP4PM you can now download my FREE MP4PM Project Charter Package! ​Click ​on the Button below to ​get ​your Free Package immediately and kick start your next Project with that Project Charter Package! ​​You will get several deliverables which you can use out of the box even if you never have done MindMapping before or even do not use a Mind Mapping Software currently. ​​Clicl on the Button to get an overview of what you will receive with this package. I am 100% confident that you will like it. Yes, i want that FREE Package now! Markus has more than 17 years of management and leadership experience, including more than 15 years in Project and Program Management. Subscribe and get notifications of all new articles, PMP tips and tricks, Resources and exclusive discount offers! We will send you a mail from time to time. We do not send spam or share your data with third party's. You are free to unsubscribe at any time. Your privacy is protected. I will never share or sell your email. PMI-ACP® – become a certified Agile Practitioner with that ULTIMATE prep tool bundle – get 30$ OFF! Only a few days left! Download the "PMBOK® Guide – Sixth Edition" and the very new "Agile Practice Guide" now! | Vom Wissen zur Praxis on Download the “PMBOK® Guide – Sixth Edition” and the very new “Agile Practice Guide” now! Download the "PMBOK® Guide – Sixth Edition" and the very new "Agile Practice Guide" now! - pmplus - the blog on PMBOK® Guide 6th Edition will be released on 6th of September 2017 – everything you need to know about the new PMBoK guide Edition and the related exam changes!! PMI, PMP, CAPM, PMI-ACP, PgMP and PMBOK are trademarks of the Project Management Institute, Inc. I do not want your Newsletter; thank you!